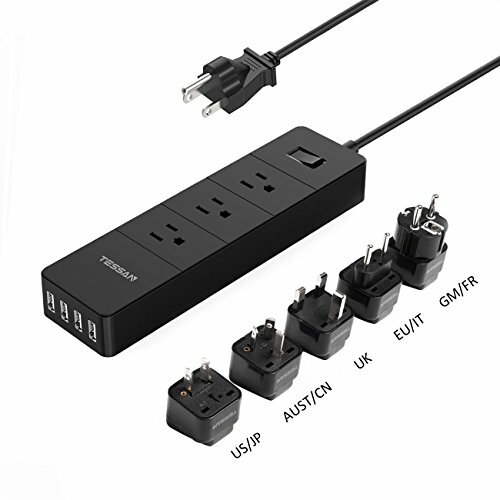 The 3 outlets surge-protector offers ultimate convenience and protection for computer electronics,home entertainment systems,and more. 15000A max and 1700J surge-suppression rating,the unit transfers optimal power and helps keep plugged-in devices safe, especially during storms and power outages. Built-in power switch,whose life is up to 6000 times,turns on/off as you need. TESSAN's multi protection safety system ensures complete protection from electrical short circuit,over heat,electric surge, over charging,over current and etc. Its beautiful chassis made of PC & ABS plastic material makes it fireproof of up to 750¡æ. With synchronousrectification and current control;Lightning protectionand surge protection function. Integrated with Intelligent Charging technology that enables each port to detect and deliver ideal input current each time of up to 2.4A. Integrated sheet copper design,high conductance and great heat dissipation,pull and plug 6000 times not loose.